Stacking Up Volcanoes | Watts Up With That? As readers of my posts know, I’ve held for many years that there are a variety of emergent phenomena that regulate the earth’s temperature. See my posts The Thermostat Hypothesis and Emergent Climate Phenomena for an overview of my hypothesis. One of the predictions derivable from my hypothesis is that the earth should be relatively insensitive to small changes in forcing. According to my hypothesis, if the total energy entering the system changes in such a manner that the global temperatures start to drop, inter alia the system responds through changes in the time and strength of the daily emergence of the tropical cumulus field and the associated thunderstorms. This allows more sunlight to enter the system and decreases the thunderstorm-caused surface heat losses, balancing out the energy lost elsewhere and maintaining the temperature. In this regard, I got to thinking about the Berkeley Earth Land Temperature dataset. It is the longest observational global temperature dataset, stretching back to 1750. This gives me the opportunity to test my hypothesis against the volcanic eruptions that have occurred since 1750. Now, the general belief is that volcanic eruptions cool the globe … but me, I don’t believe much of anything until I run the numbers myself. And I’ve run the numbers on the eruptions a number of times. I list my previous posts on the subject in the endnotes. But I’ve never looked at the Berkeley Earth record, so let me do that. Remember, if my hypothesis is correct, the volcanic eruptions should not cause a noticeable drop in the temperature. 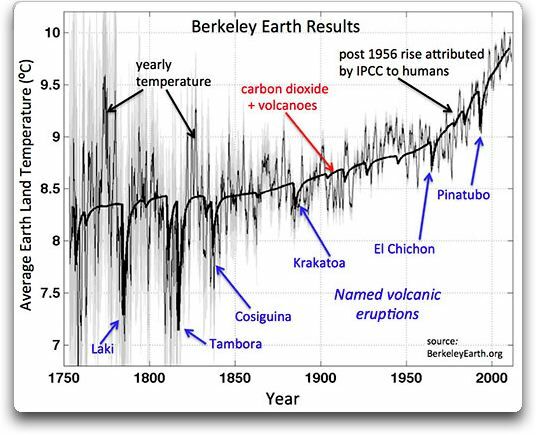 Let me start with the Berkeley Earth land temperatures. Here is that dataset, along with a Gaussian average to show the underlying variations. Figure 1. 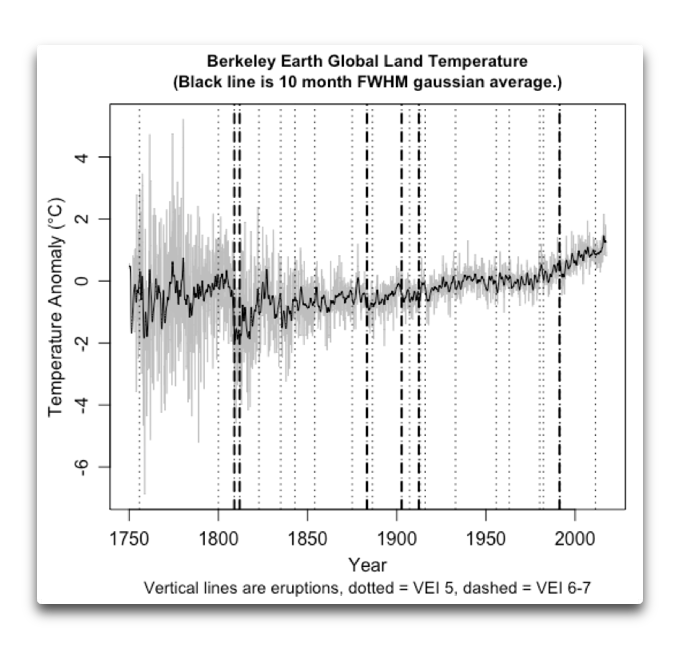 Berkeley Earth global average land temperature (gray lines) and 10-month full width at half maximum (FWHM) Gaussian average (black line). Vertical lines show the 24 largest eruptions, those with a Volcanic Eruptive Index (VEI) of 5 or above. Heavy dark lines show the six largest eruptions, those with a VEI of 6 or 7. Now, to get the average response to an eruption, what we need to do is to “stack” the eruptions. This means that for each eruption, we look at say the three years before and the three years after the eruption. We stack up this data and average it to find out the average change from before the eruptions to after the eruptions. 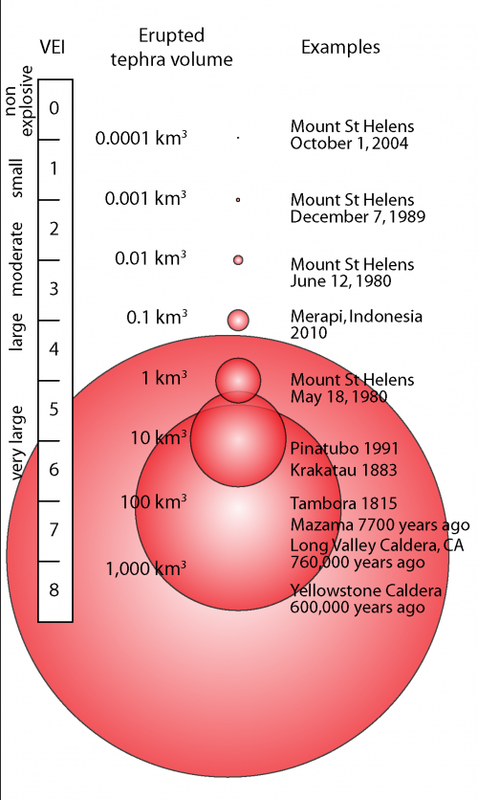 Figure 2 shows that result for the 24 largest eruptions since 1750. I’ve used the Gaussian average shown in Figure 1 to reduce the amount of noise in the data. Figure 2. Stacked 24 largest eruptions since 1750. The black and yellow line shows the average of all 24 eruptions. All values are 10-month FWHM Gaussian averages. As you can see, the prediction from my hypothesis is completely verified. On average there is no global temperature response to the 24 largest eruptions. But wait, I hear you thinking, maybe it’s only the biggest ones that cause such a response. So I looked at the six largest eruptions shown in Figure 1 above, those with a volcanic explosivity index (VEI) of 6 or larger. Figure 3 shows that result. Figure 3. Stacked 6 largest eruptions since 1750. The black and yellow line shows the average of all 6 eruptions. The blue line shows the only VEI 7 eruption in the group, Tambora in 1815. Once again, the prediction from my hypothesis is confirmed. Even the largest six eruptions since 1750 do not result in any measurable global cooling. The largest eruption, the VEI 7 eruption of Tambora in 1815 (blue line) is widely believed to be responsible for something called a “year without a summer” … but there is little sign of that in the Berkeley Earth dataset. It was just as cold thirty months or so before the Tambora eruption as it was after the eruption. I discussed this in a post called Missing the Missing Summer. Well, I’d say that this is very strong evidence that the global temperature is not at the mercy of changes in forcing as is generally believed. Volcanic eruptions clearly and measurably reduce the incoming sunlight due to volcanic aerosols both reflecting and absorbing solar energy. However, this does not cause a corresponding reduction in global average temperature. Instead, the climate system responds to reductions in forcing from eruptions by increasing the amount of energy entering the system, as well as by reducing the heat loss from the surface, in order to stabilize and maintain the surface temperature within a fairly narrow range (e.g. ± 0.3°C over the 20th century). As you can see, even the high-sulfate eruptions don’t affect the global land temperature. It’s a foggy morning here on the California coast. Two days ago it was blazing hot both here and in the California Central Valley, 108°F (42°C) in Sacramento. When that happens, the hot air rises, drawing the “marine layer” of cool air in off of the Pacific and causing today’s cool foggy weather at our house … the system responds to moderate the changes. NOTE 1: When you comment quote the exact words you are referring to, so we can all understand your precise subject. NOTE 2: Data Sources. 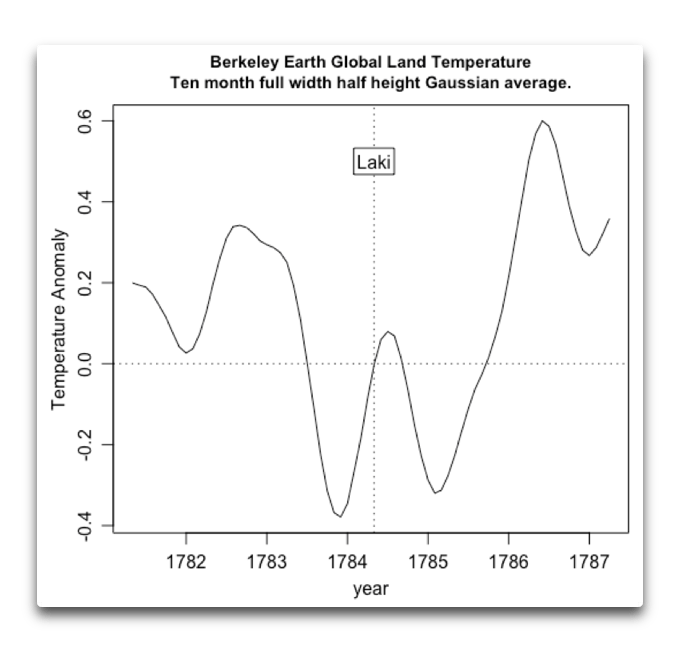 The Berkeley Earth data is here. The volcanic eruption data is from the Smithsonian. Enjoy. But maybe it’s the volcanoes that are under the Gulf stream winds that have an impact? The volcanoes on the equator will not spread the dust so far. For the same SO2 output it is indeed true that high latitude eruptions have a disproportionate effect. Another Felix specious claim, no observations, no proof; all theory and estimates. An lower energy eruption than those graphed by Willis, yet Felix wants people to believe the eruption had impacts. Impacts that were theorized by the research he links to, not measured. I did expect a notable cooling effect, but by that database, there was no clear effect. Thanks. I was wondering about that. The “year without a Summer” was in fact 1816. I remember this because of the curious fact that the last Frost Fair on the frozen Thames was held in 1814. A year before Tambora. Two years before the YWAS. It’s all a bit odd. Just a possible thought about frost fairs. They need a frozen Thames. Once the old old London bridge was demolished in 1831 (the one with shops on it and over 18 piers to support the short low tech spans), the Thames was able to flow faster and this might have reduced the ability to freeze. So temperature may not be the only significant factor. Climate and its effects are never simple (except for the ulterior motivated). Banking the river also has had an effect. Removing the piers would not make the Thames flow faster. In fact, at the bridge location it would now flow more slowly for a given volumetric flow. If the free area of the river’s cross section at the bridge is reduced by 50% because of the piers, the flow rate through the remaining open area must double. The only way that doesn’t happen is if you accumulate the water some where in a dam or catchment. The effect on ice formation will be most noticeable on the downstream side. It is possible that the piers could have acted to corral ice flows forming upstream and encouraged ice formation that way, but I’m not sure of that. It was colder in those days. The frost fairs took place during the Little Ice Age, roughly between 1350-1850. George Adamson, historical climatologist at King’s College London, says that 1814 was the third coldest January since 1659, when the Central England Temperature records began. The reason was low sun spot activity and the North Atlantic Oscillation sucking in weather from Siberia, he says. The average temperature for January 1814 was -2.9C. Today the world is gradually warming. The recent cold January of 2010 averaged 1.4C. But even more important than climate now is the architecture of the Thames. A new London Bridge was built in 1831 with fewer arches, allowing more water from the sea to pass up river unencumbered. Saltier water means a lower freezing point. And the construction of the Embankment later in the 19th Century narrowed the Thames making it flow faster, another factor making freezing less likely. “I’d be surprised if it froze again to the extent where we’d be able to allow large numbers of people on the Thames,” says Adamson. With the old, old London bridge having over 18 piers to support its short “low tech” spans over the Thames River, the outflow water from underneath the bridge would have been far more turbulent, thus causing significant “mixing” of the water column, thus retarding or even inhibiting the “freezing” of the surface water for some distance “downstream” from the bridge piers. Willis lists the Tambora eruption as 1815, repeatedly. I’ve read that it is the amount of aerosols entering the stratosphere that makes the biggest difference. Now the size of the eruption may be related to the amount of aerosols entering the stratosphere, but I doubt it’s a perfect relationship. Doesn’t the height of the stratosphere increase as you get closer to the equator? Also, the geology of the individual volcano will influence what it tosses into the air. Surely, among the 24 most powerful volcanoes there must be a reasonable number that ejected SO2 into the stratosphere … but if they had an effect, it would surely have shown up in the averages. Heck, even the average of the six biggest ones doesn’t show any effect on global temperatures. “Surely” is not a scientific statement. Science means finding all the possible confounding factors and proving that none of them matter. If it’s not possible to know all the confounding factors, then it’s not possible to declare that you have reached a definitive conclusion. You could look up estimates of SO2 releases from volcanic eruptions. Do you have a link to that data? I’ve not found any. Volcanic SO2 can affect the Earth’s environment. Where no direct measurements of SO2 in the atmosphere are available, a petrologic method of assessing sulfur release from the magma must be used. However, in studies of arc-derived eruptions, satellite-based measurements of SO2 emissions using Total Ozone Mapping Spectrometer (TOMS) data are orders of magnitude greater than those calculated petrologically, implying that a separate S-rich gas phase in the magma chamber may be responsible for the excess sulfur. We test whether this applies in other settings. For Icelandic and Hawaiian basalts we find that petrologic SO2 values are comparable to measurements of SO2 by TOMS. Thus, for non-arc basalts, the petrologic method gives reliable estimates of SO2 released. The implied absence of excess sulfur in non-arc basaltic magmas is a reflection of source magma conditions, notably lower fO2 and volatile contents than arc magmas, inhibiting the exsolution of a S-rich gas prior to eruption. Your conclusions are completely wrong. Essentially all La Ninas are caused by VEI4 or larger volcanic eruptions. I believe that you would agree that La Ninas have an effect on Global temperatures. Essentially all El Ninos are also caused by VEI4 or larger volcanic eruptions (volcanic-induced El Ninos). I believe that you would also agree that El Ninos have an effect on Global temperatures. (I say “essentially” since some are also man-made). The mechanism for both is simply changing amounts of SO2 aerosols in the atmosphere. I wouldn’t go so far as to say “all” ENSO swings are due to SO2. The sun is the main driver of the ENSO, plus air pressure and winds, which are also ultimately solar-related. With the sun being the main driver, fewer dimming SO2 aerosols in the atmosphere will allow the sun’s rays to shine with greater intensity on the ENSO area. The atmosphere is a complex thing. Some volcanic eruptions have a transient minor cooling effect, most don’t. According to at least one hypothesis, the Toba Ultra-Plinian eruption nearly wiped out humanity… Can you see Toba in the ice core temperature record? Toba may have had a climatic effect, but it wasn’t significant enough to break out of the noise level. Massive flood basalt episodes may have an effect, but I have a hunch that statistical evidence of a consistent effect would be similarly fleeting. The size and energy of the eruption are paramount. Lower atmosphere sulfate emissions are quickly washed out of the atmosphere. Powerful eruptions inject sulfates into the middle stratosphere, well above clouds. e.g. 2 Tungurahua’s Volcanic eruptions 2006-2008 generated columns that reached heights of a maximum 14,750 meters. It is not all volcanos that is where the mistake is. In order for volcanos to have a climatic effect they have to be major explosive eruptions with tons of SO2. Those are the ones that have had and will have a climatic impact and correlate to very low prolonged solar minimum periods of time. You seem to be missing the two VEI 6 eruptions in Iceland in 1783-84. A “volcanic winter” is blamed on SO2 from Laki and Grímsvötn. Clusters of VEI 5s can add large amounts of SO2 to the air in a short time. Where the eruptions occur also affects their effects on temperature and other weather phenomena. I’ve already said that BEST isn’t fit for purpose, but there does seem to be a pronounced cooling around the time of the Icelandic eruptions. Could very well be that this Best dataset is not useful for this. Best is known for using rather complicated homogenization techniques to insert unrecorded data points, adjust “breakpoints” in a record, and other techniques that would very likely affect sudden changes over short periods, such as volcanoes. They seem to be more interested in modelling(after a fashion) temperature data to make it more useful for global climate models. Hi Felix. The German annual temperature record I gave a link to before starts in 1760. It shows a greater than 2 degree C drop about 1783. Of course it’s closer and this is a regional effect but it does show in their record. Thanks. I agree that unjiggered, raw local to hemispheric readings over a short time period, so that apples might be compared with apples, would be the way to go. As a PNW wheat rancher, I know that Pinatubo affected us. The Midwest growers were, too. Thanks, Felix. I’ve used the eruptions in the Smithsonian Eruption Database. It does not list any VEI 5 or above eruptions during that time. It lists Grimsvötn, but only as a VEI 4. Dunno how the SED calculates these things, but Laki was indubitably a VEI 6. Its 14 cubic kilometers of lava alone was in the ranges of Novarupta and Pinatubo’s total products, possibly larger. As a basalt flow eruption, it also released a lot of SO2, which is the meteorologically active ingredient. With simultaneous Grimsvoten, they pumped out huge amounts of gas, so are a critical test of your hypothesis. I don’t know how on Earth the SED could have missed the most important and famous eruption of the 18th century. It’s also at high latitude. Farmers in North America took note of the effects of Pinatubo. Incredibly, the Smithsonian database does indeed lack VEI 6 Laki, biggest eruption of the 18th century. Serious oversight. Maybe because it was a fissure eruption, but that shouldn’t matter. For effect on WX, it was massive. You’re a little off. The eruption began in June 1783. Per the associated graphic the temp was already falling prior to June 1783. Had T continued down at that shallow rate, the drop would have been insignificant. But it nose-dived after June. IMO, the evidence shows that big, SO2-rich eruptions do definitely affect temperature regionally and globally, but that the effect isn’t really climatic. It passes too soon, so must be considered a WX event. I suppose that a period of elevated eruptions for decades could affect climate, but such intervals are rare in the paleo-record. Mann tried to blame the LIA on volcanoes, but the claim falls flat upon the most cursory inspection. The fact of frequent solar minima explains the cold period much better. Thanks, Felix. Beginning to end, the eruption ran for two years overall. I picked the middle of that period. You show it well after the end of the Laki eruption. The effect was prompt in Europe, Asia and North America, so best to begin at its outset, not well after the eruption ended. IIRC, it lasted six months, barely making it into the next year, if at all. You could throw in its sister eruption, which was explosive rather than flood basalt. The smaller Grimsvotn eruption did continue into 1785, but produced less SO2. “Effect only felt for 20 years”. And that for a big SO2 producer. So the BEST “data” appear to show a deep dip from Laki, with some recovery, then a lesser drop in T from Grimsvotn. Correction. Eight months for the fissure eruption, as per the OSU link. So around Marcn 1784. As noted, vents from Grimsvotn continued into 1785. But Laki was the Big Kahuna. Maybe zoom in on Tambora, Krakatoa, Pinatubo and the other biggies to the same extent and see if there appears to be a correlation, regionally and globally. Again, Felix thread bombs the comments to an article. The atmospheric effect was probably mostly during the early part of the eruption. It is often described as a mild ”effusive” eruption, but contemporary accounts describe hundreds of meters high, mile-long ”fire curtains” issuing from fissures. These probably produced enough heat for convection to “punch through” into the stratosphere even though the eruption wasn’t explosive. The sulphurous “dry fog” observed in Europe, which damaged crops and caused pulmonary problems, on the other hand was certainly in the lower troposphere. Exactly what are you claiming? That the Laki June 8, 1783 eruption included the total volcanic eruptive material? Ignoring that Laki erupted almost continuously until February 7, 1784? Your claim greatly reduces Laki’s volume of erupted material which lessens the estimated VEI rating. Willis uses the Laki eruption ending date, allowing for total Laki eruptive material. Changing to the June 8, 1783 date leaves Willis’s conclusion unchanged as Berkeley’s does not show any change in slope for Laki’s initial eruptions. How is pointing out that Willis missed the most important eruption of the 18th century “thread bombing”? What is your problem? Laki clearly falsifies Willis’ conjecture. The effect of Laki’s SO2 was immediate. As TTY notes, most of the release was at the beginning. Moving Willis’ line to June 1783 clearly shows the direct and immediate drop in T from the eruption. And that’s in global data. The same effect is visible if he were to zero in on the start of all the other big SO2 producers. Felix, let me invite you take the “Spot The Volcano” test in my post Get Laki, Get Unlaki and come back to tell us how you did. Other than immediately around the volcano, the winter after the Laki eruption was not unusual by any measure. Please do as I ask and look to see that the summer after Laki was cold, then temps briefly rebounded, only to be dropped again by Grimvotn. “The fog lifted in August”, so by winter the effect of the cloud had lessened. Look at the actual history of each eruption. Please try at least to act like a scientist rather than an advocate. It’s blatantly obvious. Focusing on the winter, when the effect had warn off, is typical of your faulty methodology. The effect of SO2 is greatest in summer, anyway. Look at reality instead of finding inappropriate ways to torture the data to fit your unphysical misconceptions. The indisputable fact is that after every big SO2 release, a large region or the whole world cools statistically significantly. Make graphs for the 19th century volcanoes as Javier showed you for the late 20th century, as you did for Laki globally, except for putting your line in the blatantly wrong place. Please try at least to act like a scientist rather than an advocate. Please try to act like a decent human being and leave off the personal attacks. It’s blatantly obvious. Focusing on the winter, when the effect had worn off, is typical of your faulty methodology. The winter was cold. Please read my link. Again, false specious claims without evidence or proof. “The Laki eruption (aka Skaftáreldar) took place over an eight-month period between June 8, 1783, and February 7, 1784. The eruption occurred in the Lakagígar craters in fissures on either side of Laki mountain between Mýrdalsjökull and Vatnajökull in the southern highlands and the adjoining Grímsvötn volcano in Vatnajökull, as stated on Wikipedia. Laki’s 1783 eruptions is rated approximately VEI-6. Remember, this rating includes the total eruptions from 130 volcanic craters; i.e. lots of smaller volcanic vents instead of a central massive volcanic vent. One of the most powerful? Nope! VEI measures amount of lava and tephra, not SO2. While a VEI 6 in terms of ejecta, Laki was huge in SO2. The effect was prompt clear around the Northern Hemisphere. Look with open eyes and mind to see the facts. T dropped promptely after the eruption started. You are absolutely right in general terms but it is not just a matter of the tropical response above water surfaces as described in your thunderstorm hypothesis. As I have told you multiple times in multiple threads the only way to keep the gases of the atmosphere suspended off the surface indefinitely is to maintain hydrostatic equilibrium within the atmosphere whatever destabilising influences such as volcanic activity (or changes in greenhouse gases) throw at it. To maintain hydrostatic equilibrium requires energy and that energy is derived from conduction plus convection and not radiative gases at all. It is implicit in your rather limited thunderstorm hypothesis that convective changes neutralise radiative imbalances and that is a long accepted basic scientific principle. Convection is a result of uneven surface heating plus consequent density differentials in the horizontal plane around a sphere lit by a point source of irradiation such as a sun. The truth is that the only scenario that fits your observations and your thunderstorm hypothesis is that the surface temperature enhancement above the purely radiative S-B expectation is due to conduction and convection and NOT radiative capability within the atmosphere. and explain to me how you think (if that be the case) my proposition is not simply a more comprehensive explanation of your observations than anything else you or anyone else has yet come up with. One last comment which is volcanos definitely impact the climate and the thermostat climatic hypothesis does not exist. What does Figure 2 look like without the Gaussian averages? Incomprehensible … a pile of spaghetti. You are now not far of agreeing with me that a little bit more CO2 cannot cause any warming? Correct but does not apply to larger changes in energy output from the sun or changes in global albedo when global cloudiness alters such as happened during the recent warming spell up to about 2000. Everything else gets neutralized by convective changes as you have stated. It is global changes in convection that matter and not just thunderstorms in the tropics. If significant solar output or global albedo changes occur then the circulation changes dwarf anything observed from volcanoes or changes in GHG amounts. The only reason that the circulation adjustments required to neutralize GHGs or volcanic events are so small is due to the fact that it is atmospheric mass that really matters and not miniscule components such as radiative gases or the output from volcanic eruptions. How else can one explain the apparently insignificant changes in global temperatures from small changes in forcing ? To explain that you need something that overwhelms all else and what is there other than atmospheric mass? It is a pretense to use Berkeley Earth or any other surface temperature record before, say, the end of WWI with any level of confidence for anything — no less testing a hypothesis about a self-regulating Earth climate system (which, I think, is correct in many, but not all, ways). If BEST is to be believed, it is quite possible that the last 100 years of the Little Ice Age was warmer than temperatures since 2000. With that much uncertainty, looking for tiny changes due to volcanic activity in the 18th and 19th Centuries, or even the early 20th Century, is hard to support. BEST is not fit for any purpose, but to show how corrupt is “climate science”. You said ‘tiny changes’. I thin you have proven Willis correct. We are told that volcanoes can create a year without summer, but in fact they can only produce ‘tiny changes’. Jeff ==> I think the Year Without a Summer is an historical fact — at least for Europe. The question is if the historical temperature record for Global Average Surface Temperature is up to verifying the anecdotally valid evidence. I think probably not. Or that a world wide “average” is the right measure to detect what may have only impacted the northern hemisphere. Fit for purpose would be looking at regional temperature records. Anecdotal records can be 100% accurate and still be statistically insignificant. Even if it doesn’t show at all in the GAST, it may well be a MCID. Presenting anything as a “global temperature” is not fit for purpose. Clouds are still king or queen if you like. Willis you often mention that cloudy nights in deserts are warmer than cloudless nights. How many clouds does a desert ever get if it hardly ever rains? I realize that the air is rarely ever close to being saturated, but does a desert get the same amount of clouds as a non desert? Not raining much and not having many clouds are not the same thing. It can be cloudy every day, yet never rain, and still be a desert. Many deserts are dry most of the year yet still have seasonal rains. The Atacama Desert, driest place on Earth, is often cloudy, or just off shore, thanks to the cold Humboldt Current. Where I live is dry, but not a desert. The difference in night time T is notable between cloudless and cloudy nights. I thought Antarctica was the driest place on earth. I think that it snows more often in parts of Antarctica with reporting stations than it rains on the Atacama, but I could be wrong about that. There may well be parts of Antarctica with less precipitation than the Atacama. The continent isn’t well surveyed. GISS, HadCRU, BEST, etc have to make up “data” for most of it. As for continents, it’s for sure the driest. The Atacama is probably the driest place on Earth, even in Central East Antarctica it does snow a little occasionally, while in Atacama it literally never rains. There’s a difference between average annual precipitation and average humidity. I would guess that although the average annual precipitation for Antarctica is more than the Atacama Desert, the average humidity in Antarctica is lower than the Atacama Desert. “Driest place” refers to precipitation. A very good description of the Namib desert. We are on the east slope of the Cascade Range in central Washington State. We get about 9 inches of precipitation annually; there is less to our south and east. I’m wast of you, around Pullman. West. Didn’t edit in time. I am at the bottom of the state of Washington. It is even drier where I am at 7 1/2 inches a year. Must be the bottom of the Columbia Basin. We thank you for all the ice-ground basalt which has blown onto our uplands, making for one of the greatest loess topsoil regions on the planet. The only thing that this study demonstrates is that volcanic sulfate effect on temperature cannot be found in BEST, not that it doesn’t have an effect on temperature. And as Salvatore has pointed above, VEI is not the way to go, as there is no relation between VEI and sulfate. An imperfect proxy on an imperfect dataset. Difficult to draw any conclusion. And then the effect on temperature of volcanic stratospheric sulfate is a well studied phenomenon, well measured after El Chichón and Pinatubo. True, as I note above, Laki in 1783 released massive amounts of SO2 and flood basalt, but relatively little tephra (although still a lot), so it’s rated only a VEI 6, based upon volume of ejecta. It also lasted for six months. Where were the ice cores taken? Why not look at temperatures close to the high SO2 eruptions, geographically and on the scale of days, weeks and months. It’s obvious in the case of Laki that your hypothesis is falsified. The historical anecdotal evidence is the same for other big SO2 producers. I’ll bet that temperature records from the regions affected would support the historical evidence. Hansen’s composite is indeed for the five largest volcanic aerosol optical depths (A)D) since 1880, based on direct global AOD measurement, not indirect measurements such as ice core SO2, VEI, or point measurements at select mountaintops. Hansen makes a good case here, although, I’m skeptical of any so-called “global temperatures” before the MSU era began in 1979. If you look at John Christy’s famous chart of global atmospheric (satellite and radiosonde) data since 1979, the two biggest events of that era are as obvious as hail dents on a Yugo. Even the otherwise flawed IPCC models got the magnitude of the volcanic coolings right, even though they way overestimate the CO2 effect. My own disgustingly simple model (radiative equilibrium, nothing else) has a more reasonable CO2 effect, along with a simple volcanic effect, fits the data pretty well. The Christy graph plots 5-year averages, which remove the climate “noise” due to weather, annual cycles, and the big noise of el Nino (which tends to recur about every 5 years), so volcanoes and longer term effects show up very nicely. Thanks, Richard. I’ve never denied that volcanoes have a detectable effect on the atmosphere. However, there is precious little evidence of the effect making it all the way to the ground. I showed this in my post on the Mauna Loa temperatures. The Hansen graph posted just above by Felix makes a pretty good case for volcanic effect making it to the ground. Hansen used the same methodology that you used – compositing major events – and I concur with Hansen’s selection of the 5 biggest. Actually, Hansen & Sato used my data for rating Agung (I’d have to scrounge around for the reference). Compositing is a good way to go, since it averages out the confounding effects of el Nino, PDO, AMO, seasonal cycles, and just plain old weather. I suspect if you blew up your scale you’d see a volcanic signal on SOME of your plots. For example, on your composite plot of 9 volcanoes (right above the Hansen plot) looks to me to show the 2-3 years after the eruption are a few tenths of a degree cooler than the 2-3 years before. That’s for 9 volcanoes, of which 5 do not have confirmed global aerosol optical depths. Hansen’s composite is indeed for the five largest volcanic aerosol optical depths (A)D) since 1880, based on direct global AOD measurement, not indirect measurements such as ice core SO2, VEI, or point measurements at select mountaintops. The Hansen graph posted just above by Felix makes a pretty good case for volcanic effect making it to the ground. Hansen used the same methodology that you used – compositing major events – and I concur with Hansen’s selection of the 5 biggest. Does the average dip below zero? Yes. But look at the time before the eruption. First, it was as much warmer on average before the eruptions as it was cooler on average afterward. This greatly weakens the argument that we are seeing something unusual or unprecedented. Next, at the time of the eruptions, on average the temperatures had already been dropping for over a year. Next, after the eruptions, there was no increase in the rate of the temperature decrease. To the contrary, the rate of temperature decrease after the eruptions is quite similar to and no greater than the rate before the eruptions. And finally, the orange lines represent the 95% of the maximum and minimum values. I determined these by a “monte carlo” analysis, taking a thousand groups of five random dates, and treating them as if they were eruption dates in the same manner as in the graph above. I recorded the maximum and minimum values of the black/orange line representing the overall average of each trial. The horizontal dashed orange lines show the range within which 95% of the data of the averages of the five pseudo-eruptions occurred. And this means that these results, both for the time before and the time after the eruption, are not all that remarkable. Similar excursions occurred a number of times in the monte carlo simulation. My best to you, and my thanks for your contributions to the discussion. 1) I do like your colorful graphs. Hansen’s looks like some droll polling data in Politico. Yours could be a designer Pride-Fest T-shirt. Or a Pink Floyd album. Or a Tahitian sunset. Take your pick – I suspect your pick will the same as mine. 2) That essential point aside, your version is virtually identical to Hansen’s. That says neither of you are wrong (I know it’s weird to agree with Hansen). The curves have the same shape, and show the temperatures for the 3 years after the eruption are systematically a few tenths of a degree cooler than for the 3 years before. It’s small, and you have to composite away to tease the signal from the noise, but it’s there. 3) I’m not sure what the zero line for temperature represents, but it really doesn’t matter. As for me, I would have taken zero degrees to be the mean for each event for the 48 months before the eruption, considering that a non-volcanic reference temperature. But again, it doesn’t matter, since it’s the changes that count. 4) The Gaussian smoothing means the composite curves will start “sensing” the eruption maybe 6 months before (2-sigma). It also leaves lots of year-long bumps and wiggles that we call “noise”. The biggest one is the post-Chichon Nino. The irregular nature of the cooling reflects these noisy bumps and wiggles. 5) Minor details – Agung was 1963-3, and Krakatau 1883-8. Correcting that would move those two curves a wee bit to the left, which eyeballing it would make the chart look a little better (for volcano buffs). 6) Years ago I got in arguments with a fellow who claimed he found the Agung signal in the 1960s. He later lost interest in volcanoes when he jumped on the CO2 gravy train and joined the IPCC and showed up in ClimateGate. In 1983 I lamented el Nino’s successful attempt to cover up el Chichon, rendering both a statistical wash (for temperature; precipitation, snow, and storms are another story). At the time we called it the “Battle of the Els”. There was a conference in Fall ’83 where I gave papers on both! Then Pinatubo came along, and I was happy – the optical dimming of the night sky, and the milkiness of the day sky, and a noticeable dullness to the Colorado sunshine, along with summer snows and frosts was a real aha! It sure looks like Hawaii’s temperatures don’t react to volcanoes very much. I suspect that’s true of other low latitude oceanic locations. There’s some work – by Alan Robock and others – that show that “classic” mid-low latitude stratospheric eruptions, like Tambora, Krakatau, Pinatubo et al. – have the greatest cooling effect at mid-high latitude continental summers. So the “year without a summer” in New England and Europe, and the pitifully cool summer that the folks in Sault Ste. Marie, Michigan, were griping about in 1992. Of course, those Yoopers in SS Marie have little right to complain about cool summer, yeh? The “hockey stick” chart shows 1993 as the coolest year of record. The summers of ’92 and ’93, one and two years after the eruption, were the coolest of record. The 1991 summer max of 80 tied 1983 (el Chichon, anyone?) for the lowest summer max temps of record. Only 3 of the 34 years have produced July snowfalls here (I’m at 8950 feet). Two of them were ’92 and ’93. There’s other stats I could bore everyone with, but they all indicate exceptional summer coolness during the 2-3 years following Pinatubo. True, it’s a sample of 1, although some partial records indicate el Chichon had similar effects (but I didn’t get the weather station fully running until 1984). This is useful for deciding which volcanoes to compare and composite. Fun and good stuff. Thanks! Yes, temps dropped after Pinatubo and Santa Maria. No, they didn’t drop after El Chichon and Agung, they went up rather precipitously. Once again, doesn’t mean it didn’t happen … but it sure means it doesn’t always happen, which makes one wonder. But the Yoopers were whining about the summer temperatures, not 5-month FWHM Gaussian means. By summer most met men mean June-July-August, but UP there they may settle for just July (or July + August). The June-July-August statistic tells a good story for Coal Creek Canyon, CO (recall that ’92 and ’93 were the coolest in the 30+ year record). Next, we have Agung, happened in February. Again should have been time to affect that summer, but it didn’t, and 1965 summer was middle of the road. Then El Chichon, in March. Just before summer, might not have affected it, might not, but the following summer was unusually warm. Finally, Pinatubo, in June. There’s a reason why the “It’s the Volcanoes” folks love Pinatubo, because it happened just before a cold year. So yes, the following summer was cold … but the peak effect according to Hansen is about two years after the eruption, and the summer two years after Pinatubo in Sault Ste. Marie was … well … just average. Overall? I’m sorry, but two eruptions had no visible effect on summer temperatures, one might have had an effect although the following summer was unusually warm, and only Pinatubo might be considered to show a slight effect … although again, the following summer was not cold. “… the pitifully cool summer that the folks in Sault Ste. Marie, Michigan, were griping about in 1992.” says my note. Looks to me like the summer of ’92 was easily the coolest since 1918, in perfect harmony with the peak effects of a large volcano occurring during the two years following the eruption (look at Hansen’s graph with a peak cooling at 1.2 years; my eclipse data verifies this). Coal Creek Canyon’s coldest summers on record were ’92 and ’93. As for all those other volcanoes, I’ll repeat that Pinatubo was the only volcano large enough to produce an unambiguous signal (although not everywhere), while the rest in the few tenths of a degree range remain obscured by “noise”, but that their effects can be teased out of good data by compositing. Frankly, I’ve never been impressed by the climate impact of these lesser volcanoes either, just as the barely detectable but minute effect of CO2 fails to impress me. But the observation that Pinatubo’s effects are larger that the “impacts” of CO2 does impress me, and is quite important to the entire climate story these days. Thanks, Richard. You’re looking at the maximum annual forcing in watts per square metre (W/m2). I think this is the wrong metric … and even there, Pinatubo is second to Krakatau. Not as large. Also, even by your measure both El Chichon and Agung peaked at ~60% of Pinatubo, so we should have seen 60% of the Pinatubo change … instead we saw nothing. No, “total eruption forcing” is not the right metric. If it were, temperatures would fall continuously for years after an eruption and stay at a now, lower level. This does not happen. Trenberth tried this approach for accumulated heating with CO2, only to discover his “missing heat” that never existed. The correct metric is the radiative equilibrium model, which I showed in referenced links above works really well. No feedbacks, no storage, no missing heat, just transient equilibrium. When volcanoes dim the solar heating, the temperature drops to where the outgoing IR decreases to match. So there’s equilibrium, and no net heat gain or loss (except for a slightly lower heat content of the atmosphere due to being 0.3C or so cooler). A few years later all is back where it was. I’d be curious what your accumulated heat loss of -11 watt-years per square meter would do to the troposphere, in Kelvins. has Pinatubo at 0.15 vs. Krakatau’s 0.12. No, “total eruption forcing” is not the right metric. If it were, temperatures would fall continuously for years after an eruption and stay at a now, lower level.This does not happen. I agree that “this [fall in temperatures] does not happen”, but you are not grasping the nettle—WHY does this not happen? 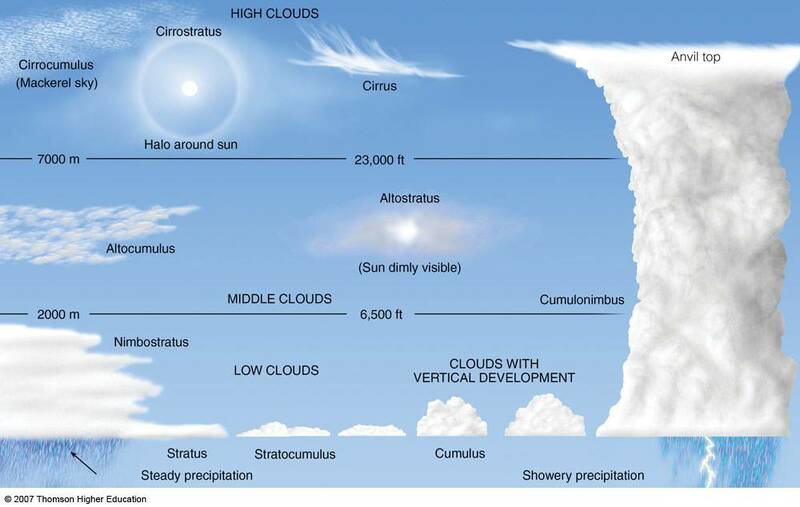 I say that it doesn’t happen because the reduction in forcing due to the eruption is quickly offset by changes in the timing and strength of the daily emergence of the tropical cumulus cloud field as well as the associated thunderstorms. You say “this does not happen” and then try to handwave it away because looking at the total energy loss is “not the right metric” … but why not? Because as you have pointed out, the reduction in forcing due to the eruptions is both real and measurable. The red line in my graph above represents a real, physical reduction in total incoming energy so … why is it that “this does not happen”? where T is temperature, F is forcing, and λ (lambda) is the so-called “climate sensitivity”. What I’ve accepted and internalized is some basic physics, including the first two laws of thermodynamics and the Stefan-Boltzmann radiation law. All combined to express “conservation of energy” as “radiative equilibrium”. It’s a fabulously simple concept with an equation I’ve taught freshmen business majors to understand and use. And the numbers it provide match the data quite nicely, within uncertainties of the data. As for why your metric doesn’t work, well, it’s because it is wrong. The wrong concept, and the wrong physics. It makes no physical sense, it ignores physics that does make sense, it shouldn’t work, and it doesn’t. The only handwaving is me slapping my forehead and uttering “mamma mia”‘ and wondering why you even thought of it. Look, what I said was that the TOTAL ENERGY LOSS from volcanoes is the proper metric rather than the peak year’s loss. It’s like when you heat a pot with a variable gas flame. How much the pot heats is a function of the TOTAL ENERGY INPUT. It is not a function, as you seem to think, of the highest instantaneous peak energy input. Heck, you’re not even following your own exhortations. You cannot get conservation of energy from your metric, peak energy input … but you can from my metric, total energy input. So in fact, you’re just putting out words that sound all sciencey without thinking them through. So please, stop with your claims that you are a scientist and it’s all basic physics. just boasting about how much you know and claims that I’m wrong and stupid. Not impressed. Again you are reaching a conclusion that can’t be supported on the data. The uncertainty in BEST prior to 1900 is bigger than the effect you are looking for. It doesn’t help either the scaling of your graph, as the looked for effect is on average a reduction of ~0.3-0.4°C. It is very surprising that you will take such a crude approach to an issue that has been studied to exhaustion and over which there is no disagreement. Large tropical volcanic eruptions that inject large amounts of sulfate in the stratosphere produce a temporary change of temperature on the entire column that goes from tropospheric cooling to stratospheric warming. Temperatures indeed went down after Pinatubo, which is why it is the poster child for the “eruptions rool temperature” crowd. That’s why I wanted to look at a larger sample size than … well … one. After every volcano, temperatures either went up or down. Picking one that went down is … well … less than impressive. Javier, you are a scientist. Why are you bothering me with a study whose sample size is one? Temperatures either regionally or globally went down after every large SO2 emitting eruption. The result is 100% out of every eruption in your “database”. Only VEI 6 (based upon ejecta) Santa Maria, Guatemala, 1902, left no strong imprint on temperatures, but its SO2 release was low. 1912 was the coldest summer of record in central Alaska and the Yukon (stations Eagle and Dawson), with records back to the 1899 Gold Rush. Chicken is about 550 miles from the Katmai volcano. It’s just that I don’t think Novarupta left as great a global imprint as some other eruptions in its class. I could well be wrong. Felix, you’re right. Katmai, aka Novarupta, was at such a high latitude that’s it’s aerosols were mostly confined within the evil “Polar Vortex”. It was truly a huge eruption, but it’s global stratospheric input was equivalent to some volcanoes a couple of VEI units smaller. What a waste of a perfectly good volcano! Vancouver, B.C., June 12. – Scores of housewives in Vancouver were sufferers because acid, presumably from the Alaskan eruptions, permeated their fine white clothes hanging on the lines after the Monday washing. Linen goods were apparently the only ones attacked. When this white wear came to be ironed it simply fell to pieces, and not until many complaints had reached dry goods houses today were the women able to solve the problem (Griggs, 1922). Why are you bothering me with a study whose sample size is one? We have good data for volcanic eruptions for the second half of the 20th century: Agung, El Chichón, and Pinatubo. That’s three out of three. Why don’t you look at those? By including data for eruptions of the 19th century and early 20th century you are just making sure that you won’t find much of an effect, since due to the uncertainty being bigger than the effect you are adding noise. There are hundreds of studies on this issue. By ignoring them, you are ignoring what more smarter, more dedicated, more knowledgeable, people with better means have accomplished on the issue. Anti-science all around. Playing with a numerical dataset without understanding the uncertainties of the data has nothing to do with science. You have demonstrated nothing with your approach. It is just wasted time for everybody. Even worse, you might convince some poor souls that your approach has some merit and they will end up worse than they started before reading your article. Dear heavens, Javier, could you be more unpleasant? A simple request would suffice. Here are your three specially chosen volcanoes. As you will note, I’ve put in the level of cooling that would need to be exceeded to be considered significant. I’ve determined the level by repeatedly picking three dates at random from 1950 to 2012, making a graph like the one above, and recording the maximum cooling of the mean shown in each graph. I used the 95% quantile of that dataset as the value that needs to be exceeded to be considered significant at the p<0.05 level. Finally, as you can see, the mean of the three eruptions is nearly as warm before the eruptions as it is cool after the eruptions ... does warming cause volcanoes? And as you can see ... this result is not statistically significant. As noted below by me and others, your methodology is all wrong. Look at Javier’s graph for the late 20th century volcanoes. That’s the way to go. Even given the poor record of data for the 18th and 19th century, the effect is detectable. Do as you did with Laki and zoom in on each eruption, but place your line at the start of the eruption to see the effect, not after a long eruption ends. The effect is transient, so start at the beginning. In every case of high SO2 releases, you’ll find what every other researcher has, ie that at a minimum there is regional cooling and usually global. The latitude matters. I have. All your previous posts on this issue suffer from the same glaring methodological faults. I don’t know if you’re trying to hide the decline on purpose through Mannish statistical shenanigans, or are simply blinded by your prejudice. Seeing is believing. Statistical legerdemain isn’t. It’s slight of hand, not science. So your claim is that after Tambora the global temperature dropped almost a degree and a half? Seriously? READ MY POST called “Missing the Missing Summer … nothing of the sort is visible in the records. Not my claim, but what BEST shows. You know, the “record” which you used. So does the historical record. We have documents as well as thermometer readings from the 18th, 19th and 20th centuries to go on. I’ve read your prior feats of statistical legerdemain. They’re meaningless. The facts show you wrong. No amount of number crunching sleight of hand can change that. “Seeing is believing.” True, that’s why magic works. But what you are seeing in this graph is a model: CO2 and volcanoes, not real data. See the link to this press release in my comment a bit down from here. Statistics, when done right, is what keeps science honest. You truly are a charming fellow, aren’t you? You kiss your momma with that mouth? Tambora erupted in April of 1815, so your graph is a joke. The effect of Tambora took a while to spread to the opposite side of the world. @Willis- 1963 on the German chart is about 1.0 dgC below its mean. 1983 on the German chart is about 1.0 dgC below its mean. 1995 is about 1.7 dgC below its mean. Does this mean anything? I dunno. I am sorry you find me unpleasant when I am trying to help you understand why you are not getting the correct result. The result that you get with the three latest eruptions is the effect that volcanic eruptions have, ~ 0.1-0.3°C decrease depending on the eruptions considered. Also volcanic eruptions are not the only factor affecting temperatures, so if there is an El Niño the cooling effect is quenched, as it happened in 1982 with El Chichón. I am not surprised that you don’t find it significant, but that doesn’t mean that it is not real. Here you have an study that removes low frequency variability and ENSO before doing the analysis. Javier ==> I’m afraid I totally agree with you. w’s problem here is a failure in study design, a step that needs to be done before any data sets are downloaded or any numbers are crunched and r-coded. BEST is a statistically questionable data set under any circumstances but before WWI (1920 or so) its acknowledged uncertainty is too great to allow for any serious work for numerically small climatic effects (such as volcanic eruption perturbations). Numerically small in a global metric is not the same as physically small when we speak of local or regional effects — so the Northern Hemisphere could have been hammered climatically with a “Year with No Summer” with hardly a blip in the GAST metric. I think of your hypothesis as atmospheric buffering…that is as a system it actively buffers against some amount of change, or at least slows it down. It is also quite likely that it can be overcome if too much energy change occurs over a short time, hence things like “The Little Ice Age” can occur. What is clever about this is it seems “tuned” to a specific range that is good for mankind. Such special behavior would normally raise a red flag, but in the case of humans (and animals and plants), they evolved to the specific range of conditions; the range didn’t change to make humans more comfortable. So again, it makes sense. Without this climate-control system, it is possible that specie die-offs (extinctions) would be more frequent and severe, and that complex life forms would have trouble getting started. So such a climate control system may be a requirement of finding intelligent life in the universe. I think your use of the term “atmospheric buffering” is appropriate and analogous to the term’s meaning in chemistry. Changes that upset the equilibrium are partially compensated by the system components (by dissociation/re-association in the case of chemical buffers) within a specific range. Only when excessive changes occur that exceed the buffering capacity (Milankovic-type orbital changes, etc) does the system move beyond its equilibrium range to establish a new equilibrium as, for example, the onset of an ice age. Water would seem to be the essential component in this buffering action due to its multiple phase changes across the temperature & pressure ranges where life exists, it’s high specific heat and latent heat capacities and the properties of those individual phases (LWIR absorption, reflectance/albedo, thermal insulation, low density of the vapour phase, etc). The dark line is the result of a model. Note that the cooling for their notated volcanoes is never greater than the yearly temperature variations of the surrounding years, and that there are many other years as cold or colder. Another example of Curve Fitting Is Not Proof. Mmm, but both of those graphs show a pretty clear cooling trend. Looks to me like about a 0.3 degree drop in the first and 0.5 in the second. So I don’t think you can say: “do not result in any measurable global cooling”. Since both graphs show an equivalent “pretty clear warming trend” in the period just before the eruptions, I’m gonna say it is random fluctuations … unless you think that warm weather causes eruptions. Also, I probably should have added a standard error indication … in both cases it’s larger than the “pretty clear cooling trend”. If the inflexion downward is just an artifact, then I am mistaken. Hi Willis. Very interesting, thanks. It does support your thermostat hypothesis. My question is how does your thermostat hypothesis allow for a little ice age event or a transition to a major stadial? Earth’s climate system is largely self-regulating within each of its states. The glacial intervals are less stable, since less liquid water. They show bigger swings than the interglacials, but similar periodicities. Glacial D/O cycles have about ten times bigger swings than Bond cycles during interglacials. As the world entered the LIA near the end of the 13th century there were some large volcanic eruptions, but I think we can safely say that had little to do with the cooling. So we would be looking for some other mechanism, could it have been a Bond Event? Most date the LIA from around AD 1400, ie the end of the 14th century. Those who prefer the end of the 13th century tend to be volcano promoters, like Mann, who don’t want the driver to be the sun. But volcanic effects are short-lived. You would need a bid one every few years to sustain the LIA from volcanism alone. The best explanation for the LIA and prior centennial-scale coolings in the Holocene is solar activity. Earth was hit by a series of solar minima from the late Medieval WP to the 19th century, such as we haven’t seen since. The depths of the LIA coincided with the Maunder Minimum. Earth has been warming since then. The warming accelerated after the end of the LIA, since we haven’t suffered a minimum since then. The sun has been active during the Current Warm Period, with minor cyclical ups and downs, which explain, for instance, the post-WWI warming, post-WWII cooling and late 20th century warming. Do you give any credence to the story that the LIA was not a Bond Event? There really aren’t Bond “events”. There are Bond cycles. But, yes, IMO all the Holocene centennial-scale fluctuations are the warm and cold phases of Bond cycles, controlled proximally by oceanic oscillations and ultimately by the sun. Hi IronicMan- The Wolf, Sporer, and Maunder minimums were ‘allowed’ by the Milankovich obliquity falling past 23.5 around 1300, reducing insolation above 65 dgr, and the inactive sun cycles during the Eddy and Bray minimums. So it was not triggered by a Bond event, now should be called a 1500 yr LuniSolar event. The storminess cycle normally starts up at the low and peaks about 7 at the cycle peak 750 yrs later. In 1250 it started early, and peaked at 14, about double, ending early as well. *Here’s some wiki dust … the term was introduced into scientific literature by François E. Matthes in 1939. It has been conventionally defined as a period extending from the 16th to the 19th centuries, but some experts prefer an alternative timespan from about 1300 to about 1850. Climatologists and historians working with local records no longer expect to agree on either the start or end dates of the period, which varied according to local conditions. My notes- The Oort minimum was around 1,000 to 1050 ad, some 250 yrs before the ‘main’ Little Ice Age. Starting on these dates, we see 90 years of weak Sun output with rapid cooling, followed by 20 to 40 Years of cold with slow warming, then 30 years of more rapid warming typically. The Dalton min of 1790 wasnt as deep or long. You said- So we would be looking for some other mechanism, could it have been a Bond Event? *In Javier’s articles, these occured during the almost coincident Eddy cycle (980 yr) and Bray cycle (2450 yr) minimums. Bond events turn out to follow a 1500 yr LuniSolar cycle, and the Wolf solar minimum starts just before a 1500 yr min, and marks the beginning of increased storminess. Thanks Sandy, I’ll focus on the Wolf Minimum and the great North Sea Storms. Sandy the Wolf Minimum was from 1280 to 1340. Could it be related to the 60 year climate cycle? My 2 cents- suppose you have 2 or three million ton pendulums (oceans, land) that are slowly swinging in an arc taking 50 to 70 years to complete. Now off to the side you put a massive wind machine that puts out puffs of air at a 60-year interval. After 20 to 100 Puffs the pendulums will start to be entrained with the puffs of air. Okay thanks, Hubert Lamb reckoned he saw a 50 year cycle. I have always wondered how “weak sun output” can be separated from weakened sun’s rays due to dimming volcanic SO2 aerosol emissions. Can you explain how this is done? @Burl said- I have always wondered how “weak sun output” can be separated from weakened sun’s rays due to dimming volcanic SO2 aerosol emissions. * in the case of weak Sun output, suppose it changed from 1365 watt per meter squared to 1360 watt per meter squared. The earth would slowly start to cool without any change in albedo due to less energy input. In the case of dimming from SO2 in the high stratosphere the albedo would go up, causing some energy to be reflected rather than absorbed, again causing cooling, but not acid rain. This statement implies that reduced solar output causes acid rain, (which is nonsense), and that the difference is that stratospheric SO2 does not. I need a better explanation as to how to distinguish solar dimming from dimming due to /SO2 pollution. * that was a test to see if you would read my response, heh. Actually I didn’t get back to edit that before the timeout occurred. You’re right. The dimming Sun would not have acid rain whreas the SO2 would have the potential for acid rain. @Burl- as you might expect this separation of causes will be damn difficult. Especially if they are both acting at the same time. You will need to be able to get the top of atmosphere solar insolation plus measure the SO2 globally at the same time. Then you can calculate the cooling due to each effect. That is all I can suggest. What you are telling me is that any cooling during the Little Ice Age which is ascribed to changes in solar output cannot be proven, and are undoubtedly simply due to Volcanic SO2 aerosols. This would also apply to all such claims prior to the modern satellite era. @Burl said- What you are telling me is that any cooling during the Little Ice Age which is ascribed to changes in solar output cannot be proven, and are undoubtedly simply due to Volcanic SO2 aerosols. *Not so fast there Tiger. You are hearing what you want to hear and ignoring all the rest. Simon & Garfunkel use that in a song long ago. This is what I said, “as you might expect this separation of causes will be damn difficult. Especially if they are both acting at the same time. You will need to be able to get the top of atmosphere solar insolation plus measure the SO2 globally at the same time. Then you can calculate the cooling due to each effect. When an object cools it shrinks. If it is spinning like a ballerina and pulls in its arms it spins faster. So that shrinking and spinning would cause the magma to have marginally more pressure and actively seek a thin spot to pop out as a volcano. QED. I would refer you to the paper “Abrupt Onset of the Little Ice Age triggered by volcanism and Sustained by Sea-Ice/Ocean Feedbacks, G. Miller, et al (Geophysical Research Letters, Volume 239, issue 2, January 2012. It is the heighth of hubris and arrogance to think humans, in the space of 150 years, can change thermal cycles that are thousands of years long and have existed for millenia. This is true for impulse events like volcano eruptions as well. The thermal mass of the land and oceans is enormous. The temperature of deep, still, parts of the ocean have barely risen one degree in 22,000 years, the last glacial max. I recently submitted a Guest post to Anthony titled “Atmospheric SO2: Principal Control Knob Governing Earth’s Temperatures” which explains the changes to Earth’s temperatures , both historically and since 1850. However, I have never heard from him. Humans, are indeed modifying Earth’s temperatures, but not because of greenhouse gasses. The effects of volcanoes don’t last long enough to affect centennial-scale fluctuations like the Medieval WP, the LIA and the Current WP. The Current WP has had more big volcanic eruptions per unit time than did the LIA, which was more active but with fewer VEI 7s than the MWP. The important difference is in solar activity. The MWP ended not c. 1250 but c. 1350, or later. Earth quickly recovered from the AD 1257 and 1280 eruptions. 1808 Event, Various, VEI 6? MWP: Six per 550 years. LIA: Nine per 500 years. CWP: Six per 168 years, so far. But so far no VEI 7 in the CWP. But two VEI 7s in the MWP. I didn’t include in the Medieval WP the AD 934-40 VEI 4 Eldgjá eruption (Laki system), Iceland, even though it released an enormous amount of SO2. Leaving on vacation. Can’t respond further at this time. Burl, thanks, but I fear you are about six years late to the party. I would refer you to my 2012 post entitled Dronning Maud and the Little Ice Age, wherein I discuss the many problems with that paper. On this, I must concur. The volcano hypothesis of the LIA was ginned up by the Team to try to get rid of the LIA as Mann’s bogus “Hockeystick” got rid of the MWP, as per Overpeck’s program. The LIA, like all prior cool and warm cycles, is totally explained by solar activity. Volcanic-induced cooling during cool periods, such as Tambora during the Dalton Minimum, can naturally be worse than during warming cycles. But as my tabulation above shows, there really is no significant difference between volcanism during warm and cool periods. Indeed, the MWP, properly defined, suffered more VEI 7s than did the LIA. The geomagnetic storm causes another increase in Kilauea’s activity. Hi Willis. With such skeptcism over the BEST record, is it possible to compare your biggest SO2 ejectors start year to the German government temperature record I found from 1760 to 2010 ? Sandy, do you have a link to the German temperature data? @Willis, Felix- I pasted the chart name in Google and guess what …. Thanks, Sandy, but I was looking for the German temperature DATA, not the German temperature GRAPH. Do you have a link to the data itself? Hi Willis. I got this from the middle of the Wiki page about the chart. Hi Willis. This is a link to Rainier lippert’s wiki page which has lots of links to Something in German. Hi All- the German record i mention above shows five yrs, 1813-1817 are 0.5-1.0 dgC below the average. So the year without summer had some precursor? You argue that volcanoes do not lead to cooling since they do not show up in the thermometer record as cooling events. You adduce evidence supporting that contention. Your argument might be right, but the equally plausible explanation, for your findings, is that the thermometer temperature record is not fit for scientific purpose, ie., that as a matter of fact volcanoes do lead to cooling, but the thermometer temperature record has been shown incapable of revealing this fact (if indeed it is a fact). It makes sense that volcanoes would lead to short term cooling (even if the system is self correcting), I suspect (and this is just an opinion because of deficiency of data) that the real position is that the global thermometer data sets are not fit for scientific scrutiny. That is why one cannot detect any trend in them in response to volcanic eruptions. I have long held the view that the global construct is flogging a dead horse. 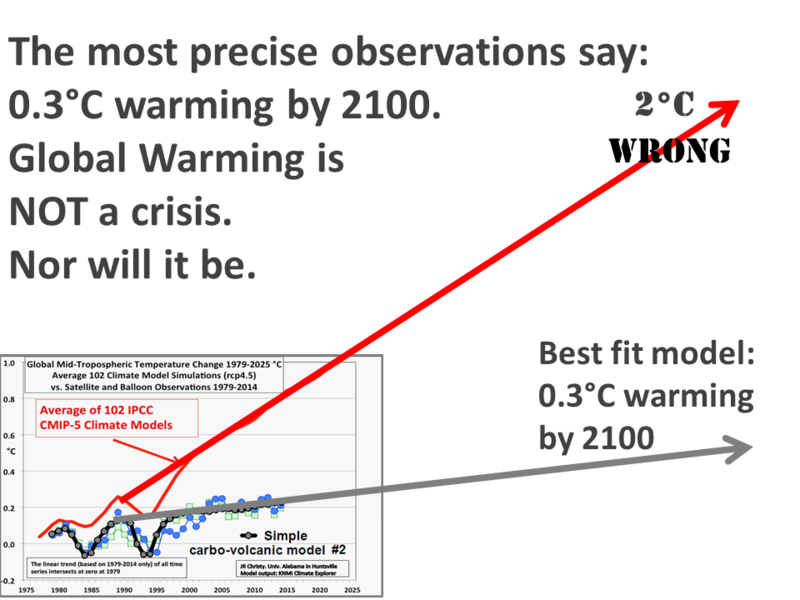 The Climate Scientists should work with the cream, not with the crud, and they should simply audit all stations and select the 200 most prime stations (least impacted by environmental change) reasonably spread across the main inhabited zone of the Norther Hemisphere, and simply compare each station with itself (with no adjustments whatsoever to station data). There should be no attempt at krigging, infilling, spatial adjustments, homogenisation etc. No statistical games, just simply compare each station individually with itself, and nothing more than that. The stations should be retroffited with the same type of equipment as used in the early 20th century, and readings should be made using the same TOB as used at that station, so RAW data can be directly compared. We would then truly know whether temperature has truly changed at any place. As matters stand, we do not know whether the temperature today is any warmer than the 1940s, or for that matter the 1880s. A genuine error spread is so large. @Richard- this might be what you’re looking for but I don’t know if they still have a budget. The Global Historical Climatology Network (GHCN) is a database of temperature, precipitation and pressure records managed by the National Climatic Data Center, Arizona State University and the Carbon Dioxide Information Analysis Center. This is so clear cut I do not even know why I am going to comment but I will. It is with 100% certainty that large explosive SO2 volcanic eruptions are going to result in a period of time of global cooling following the eruption. Scientific hypotheses are tested by observing and making predictions. In every relevant case, you are wrong on that basis. Novarupta was far enough north that its cloud was largely limited to above 30 degrees N, although its effects did dip down into India south of that latitude. This limited distribution dampened its global signal. The cooling effects of Laki, 1808, Tambora, Krakatoa and Pinatubo, plus smaller SO2 releases, such as Chichon, are well known. The point is not that they don’t cause T drops, but that the effect doesn’t last long. Your methodology in this post is all wrong as well. Perhaps you can understand why being “well known” is NOT enough on my planet to believe something. I say again, read my post called Missing the Missing Summer, and take the “Spot The Volcano” tests contained therein. You cannot tell when the volcano erupted by looking at the temperature records … color me unimpressed. By “well-known”, I mean has been observed over and over again, without exception, in every relevant case, and that the effect is exactly as would be expected, given the properties of SO2. You ignore the data. It’s plain to see from the most cursory examination of the temperature record that large SO2 injections cause regional and/or global cooing. It’s simply a scientific fact, ie an observation of nature. No amount of crunching inappropriately can change that fact. Move your Laki line to June 1783 and it will be obvious even to your blinkered gaze. And that’s in global data. Look at the records in Eurasia and North America for that year. You might be right, but the equally plausible explanation is that the data that you are using is not fit for purpose. It may not be any error in your methodology, but simply a data issue. The thermometer record contains such wide margins of errors that it is not fit for scientific purpose and that may be the reason why no signal can be detected in the thermometer record. I have long held the view (frequently expressed) that anyone who considers that one can reasonably rely upon the thermometer record for scientific study is deluding themselves. Richard, I have shown my results (little or no cooling from volcanoes) using individual station data from dozens of stations, the HadCRUT global data, the Berkeley Earth global data, the GISS global data, the CET data, the Mauna Loa data, the ice core data, and more … so I have to ask, just what data would you recommend? I do not disagree with your analysis, but I consider that the thermometer data sets to be not fit for scientific purpose. And therein lies the problem. There is simply no suitable ready available data set that would test what Climate Sensitivity there is to volcanos. The thermometer data sets probably have an error bound of around =/- 0.4degC (historically perhaps even more), and as such they are incapable of eeking out a signal to Climate Sensitivity to CO2, or for that matter to volcanos. To compound problems, there is a lot of noise, and everything of substance is lost in the noise. In my opinion, what you have very ably demonstrated is the unfitness for purpose of the thermometer data set. A useful finding. Just as M@nn discovered, when he identified the divergence issue; ie, that either trees were not a good proxy for temperature, or that if they are a good proxy, then the adjusted thermometer data set had become so hopelessly bastardised that it no longer was a reliable metric for temperature, and that the thermometer data set was thereby unfit for scientific purpose. I do not intend denigrating you by comparing you with M@nn, but the both of you have illustrated the short comings of the thermometer data set. Because of these shortcomings, we do not know whether the planet today is any warmer than it was in 1940, or for that matter in 1880. All we know is that there has been some warming since the depths of the LIA, but how much is not known. Your conclusions are completely wrong. Volcanoes have a profound effect upon Earth’s temperatures. 1. Essentially all La Ninas are caused by VEI4, or larger, volcanic eruptions. I believe that you will agree that La Ninas have a noticeable climatic effect. 2. At least half of the El Ninos that have occurred since 1850 were also caused by VEI4 or larger volcanic eruptions (volcanic-induced El Ninos). Again, I believe that you would also agree that El Ninos have a noticeable effect upon Earth’s temperatures. Also, an eruption will not produce a La Nina if it occurs during an El Nino (as happened for both Krakatoa and Pinatubo). And a volcanic-induced El Nino will not occur if it is quenched by another eruption. The mechanism for both La Ninas and El Ninos is simply varying amounts of SO2 aerosols in the atmosphere. @Burl said- Your conclusions are completely wrong. Volcanoes have a profound effect upon Earth’s temperatures. *Whoa Hoss! ‘Profound’ means having a significant long lasting effect. Causing the temperature to drop .3 to .5 degrees globally for 6 to 18 months is not profound. * I have to say Willis conclusions are not completely wrong. He has presented a dataset, analyzed it and drawn conclusions. You may not agree that the data set is fit-for-purpose, however, he has done the exercise correctly and conclusions are correct for that exercise. Back off! * by ‘properly’ what you really mean is my way or the highway. This is not a very persuasive way to debate. At one stage, I had read every comment. To summarise. >>>>No one disagrees with Willis’ general and underlying approach, ie go back to the data and see what the data says. >>>>No one has shown that Willis has erred in his analysis of the data. >>>>No one has produced evidence that the result of the analysis is wrong. >>>>Some have queried whether it included all the right volcanos, and Willis updated the results and again the same finding was achieved. The issue is with the conclusion as drawn by Willis. Since Willis’ analysis appears correct and includes all the main vocanos, Willis’ conclusion is supported by his findings, and may be correct, ie., that volcanos do not impact upon temperature. The reason why they do not may be moot, but if they do not impact upon temperature then it appears that some self correcting factor comes into play. However, there is an alternative plausible explanation to be drawn from the result that Willis has laid out, namely that the data sets are deficient and not fit for the scientific scrutiny that Willis is placing them under. In my opinion (and it is only an opinion) his findings are explained by lack of fitness of the underlying data that he is analysing. This is based upon 2 points. ——First, there is evidence that volcanos do have an impact on temperature, and one would expect them to do so, given the vast amount of particulate matter they discharge high up in the atmosphere. ——Second, there is a vast body of evidence to suggest that the thermometer record is defective (it would take an entire blog post, or series of blog posts, to fully lay that evidence out). To wrap up: If one is of the view that the data sets are sound, then Willis’ conclusion is more than reasonable; on its face it would appear correct. But I emphasise, that his conclusion is only correct to the extent that the data sets are sound and fit for scientific scrutiny. My view is that they are not. As regards ENSO, the assertion that both La Nina and El Nino are caused by varying amounts of SO2 in the atmosphere, I would wish to see some hard evidence backing up that claim, before I would consider that such a claim even gets off the ground. An example of the hard evidence: The 1997-98 Super El Nino was caused by a 7.7 Megaton reduction in atmospheric SO2 levels between 1996 98 due to Clean Air efforts, and the 2014-16 super El Nino was mostly caused by a 29.1 Megaton reduction in SO2 levels by China ( to comply with a 2014 pollution reduction target). “Profound” can also mean “thoroughgoing (profound changes)”. It does not have to be a long-term effect. Willis is claiming that volcanic eruptions have no significant climatic effect (but they caused the Little Ice Age), and they have caused most of the La Ninas and El Ninos, which are significant short-term effects, but which are not obvious in his analysis. I agree that I could have used better phraseology in my post. However, a different form of examination of the climate record is needed to show the correlations between volcanic eruptions and La Nina and El Ninos. There seems a lot of agreement that volcanic sulphates in the atmosphere will reduce sunlight and should reduce global temperature. If the temperature is actually stable then some other variable must be adjusting to compensate. This might be the timing and extent of tropical cloud cover you mention in previous articles. Is there enough data somewhere to plot cloud cover changes after eruptions? OK, for all you good folks who’ve been telling me I’m using the wrong dataset and looking at the wrong volcanoes, here’s the Central England Temperature dataset, along with what you say are the right volcanoes. In England, the effect of Laki in summer was heating, as per Javier’s link on the temperature based upon latitude and season. Presumably the cloud acted as a blanket there, as thicker than globally, where the effect was cooling. But it made the winter in England cold, as well, as shown in the CET, if it is to be believed. As your BEST graph showed, globally the effect was cooling, again if BEST “data” are to be credited. As I pointed out in my post “Get Laki, Get Unlaki”, it is not possible to identify the time of the Laki eruption based on nearby temperature records. There is nothing in those records that stands out, nothing unusual. Many reports and proxy climate records implicate the volcanic cloud in meteorological anomalies, including notably hot 1783 summer conditions in England and a severe subsequent winter. It’s not the coldest winter in that 60-year period. Nor is it the second coldest … or the third coldest winter. Or the fourth. Or the fifth coldest winter. It’s the sixth. And there are two other winters just a few tenths warmer. The Laki winter just barely makes it into the coldest 10% of the winters during that time, not statistically significant or notable in the slightest. We know precisely when the eruption occurred, and what it’s local effects were from eyewitness accounts. The immediate local and regional effects of so much SO2 will be mixed, but the global effect was cooling. The theory of pet theories is that science works better without egos and emotions. Here are some pet theories. It’s the CO2. It’s the sun. It’s the sunspots. It’s the cosmic rays. It’s the volcanoes. There is nothing wrong with these as ideas of something to investigate. Any or all could be true. Or not. Don’t start believing it until no skeptics can find fault with it. Because the alternative is that it’s all in your imagination. Coincidence. The weather was cold, the crops were failing. It happens. In those times, they say the people said the gods were angry at them, but they could also blame things on comets and distant volcanoes and witches. In these times, we blame humans, same thing.